Don’t have a lot of time to spend on dinner? Try this fast hands on Crockpot chicken recipe that take just 15 minutes or less of hands on work. Enjoying a home cooked meal has never been easier! Let supper cook while you are at work and then enjoy a delicious,healthy meal cooking that your family will love. This Crockpot roasted chicken recipe is one just like Grandma used to make. This is an easy recipe to make and also includes a recipe for “what to do with the drippings” when your roasted chicken in cooked. Chicken just like Grandma used to make . Wash and dry chicken, remove any giblets from the cavity. Save the neck for stock. Take a heaping tablespoon of kosher salt and rub it around the inside of the cavity. Any remaining salt on your hands can be rubbed on the outside of the chicken and sprinkle a few pinches of black pepper, as well as the garlic and thyme in the cavity of the chicken. Truss the chicken by tying the legs together. Rub the outside of the chicken with olive oil and paprika. Place the onion slices on the bottom of the slow cooker insert and place the chicken on top of the onions. You do not need any liquid, I promise. Cover and cook on LOW for 7- 8 hours or HIGH 4-5 hours. Serve with the cooked onions and pan juices, if desired. Leave whatever you didn’t use in the slow cooker (juices and onions). Remove all the bones from the entire chicken and place in the slow cooker with any additional chicken parts you have, including the neck from the chicken you just cooked. Add vegetables and enough water to to come up to about an inch from the top. Cover and cook on LOW for 8 hours or overnight. Strain and use immediately if you don’t see too much fat at the top or cool slightly and refrigerate. When cold, skim and discard any fat from the top. Stock can be kept in the refrigerator for up to 4 days or frozen for up to 3 months. Can’t wait to try your recipe! It sounds sooo delicious! I use crock pot a lot in the fall! I just love a good chicken recipe. Make it in a crockpot and that is awesome. Nothing better than coming home and being greeted by dinner all ready to go in the crock pot. I discovered the crockpot method of cooking whole chicken a little while ago and I can’t believe anyone cooks it any other way. This recipe sounds incredible and I can’t wait to try it. Mouth is watering already! I am the type to burn any recipe I try but I am going to share this with my wife to make for us because it looks delish! I love chicken in a crockpot. It comes so moist! Those spices sound perfect! Chicken cooked like this would be so comforting and I bet the leftovers would be great in soup. I love using my crockpot and have made quite a few recipes but have never attempted a whole chicken! I’ll have to give this a try! Love, love, love my crock pot. It’s such a great feeling that dinner is practically done at the end of a busy day! This sounds delicious. I’ve never used a crock pot and need to start! I .have made chicken in my crockpot before but I think I cooked it way too long because it all fell apart and was tender but all the bones and everything were mixed in so it was a pain. I will have to try your recipe instead! 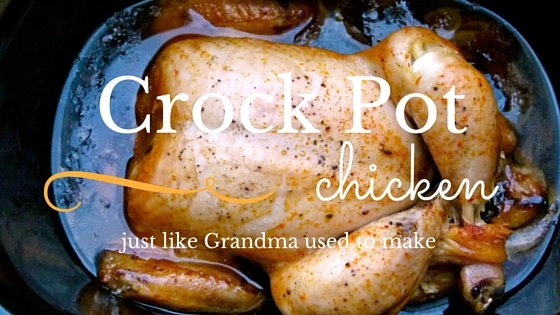 My husband makes chicken in the crockpot just like my grandmother used to make it. It’s SO good and you can smell it for hours. So awesome and so great for fall. I was literally looking for a recipe like this last night! I’ve bookmarked for the next time I’m in a poultry panic! This sounds really easy…and tasty! I love using my crock pot. The whole set it and forget thing really appeals to me and I like having warm, hearty meals ready when everyone gets home for dinner! Crockpots, Chicken and EZ are my faves! I will add this to my list for Fall cooking! Thanks! What a great recipe. I can not wait to try this. Sounds delish! I can’t wait to try it! Well that’s EASY! ha ha! I use my crockpot at least 3 times a week because I can’t always stand at the stove (back surgery). 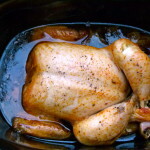 This crockpot roasted chicken sounds amazing, thanks for sharing. Now this is my kind of cooking. Easy and delicious. I love the crockpot! Especially now that it’s sport season for my kids, w always have a meal ready! It’s very helpful cooking with the crockpot and I swear by mine. But, I must say that I haven’t tried browning the chicken first. I will have to try that, sounds delicious. Thanks! We hardly ever use our crockpot and I think it’s because we don’t have any really good recipes. We buy whole organic chickens when they go on sale so we’ll try this. Thanks! I love cooking crockpot meals. It makes the day so much easier. Thanks for sharing this with us. i like slow cooker meals. My children like it when they come home from school and the house smels delicious. Yum! What a great recipe. I am sure my kids would love it too! I do my chicken this way as well. It is so easy and makes the chicken extremely moist! This is basically what we had for dinner tonight, except I used chicken pieces not a whole chicken. I love how easy this is to make. What a great tip. We eat a lot of chicken in our home, my husband says he is going to grow feathers and start squalking like a chicken! I love simple and easy recipes. Having the crockpot makes it even fuss free..BONUS!